CueMix FX gives you comprehensive graphic control over your mix. CueMix FX is a software front-end with attractive graphic mixing, graphic editing of EQ and a convenient tabbed interface. 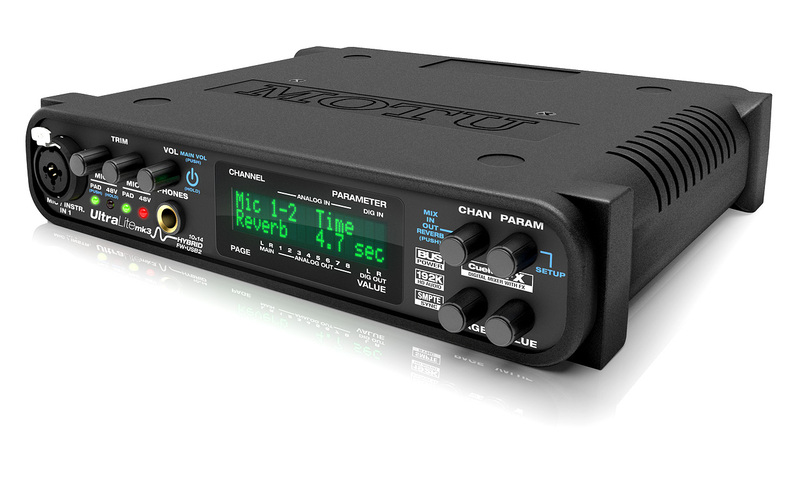 The Ultralite-mk3 Hybrid is MOTU's most compact and versatile audio interface, featuring hybrid FireWire/USB2 connectivity to your Mac or Windows computer, on-board mixing and effects, superb sound and reliable performance. 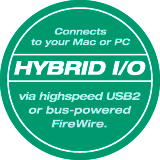 As the first-ever "hybrid" audio interface of its kind, the UltraLite-mk3 Hybrid provides flexible and mobile operation via FireWire or hi-speed USB2 connectivity to a Mac or PC computer, with professional audio quality at samples rates up to 192 kHz and plenty of I/O, including two mic/instrument inputs, six line-level analog inputs, ten channels of analog output, stereo S/PDIF and a stereo headphone output. Connect all of your studio gear, including microphones, guitars, synths, keyboards, drum machines, effects processors and even MIDI devices. Record, monitor, route and process all of these live inputs using the professional on-board CueMix FX digital mixer — with no latency and no processor strain on your computer. Apply hardware DSP-driven effects processing to inputs, outputs, and busses independent of your host computer. Add Classic Reverb™ with lengths up to 60 seconds. Further sculpt your sound with 7-band parametric EQ featuring filter types carefully modeled after British analog console EQs. Choose between two forms of compression: a conventional compressor and the Leveler™, an accurate model of the legendary LA-2A™ optical compressor that provides vintage, musical automatic gain control. The included CueMix FX cross-platform mixing software provides attractive graphic mixing, graphic editing of parametric EQ, and a convenient tabbed interface for quick access to all features in one window. Advanced signal analysis tools include a full-screen real-time FFT display, spectrogram "waterfall" display, oscilloscope, X-Y plot and linear or polar phase analysis. 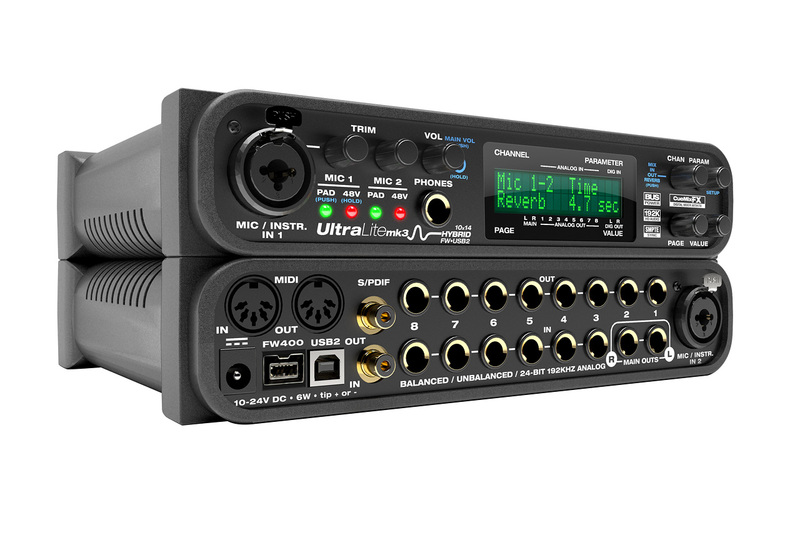 After programming the on-board mixing in the studio, unplug the UltraLite-mk3 Hybrid from the computer and take it on the road for operation as a stand-alone mixer with effects. All mixing and effects parameters are adjustable using the front panel backlit LCD. The UltraLite-mk3 Hybrid provides cross-platform compatibility with Mac and Windows and all of your favorite audio software and host-based effects via WDM/ASIO/Core Audio drivers. Or you can use the included AudioDesk workstation software for Mac, with 24-bit recording/editing and 32-bit mixing/processing/mastering.